I've included the 16 teams from this years ESPN league with the same names (these can be changed if you wish), I'd like to offer everyone who was in the league this year the opportunity to join this league, if we have anyone who wishes to drop out then I'll offer the spaces to others on the board. I'm hoping we can get this sorted out some time in January and hold a draft around February or March time. These rosters will then be kept over the summer and supplemented with a rookie draft before the start of the season in September. Using the current ESPN league I've emailed the details of the league out to each of the existing owners. This league will have a small fee which will be due in the summer. 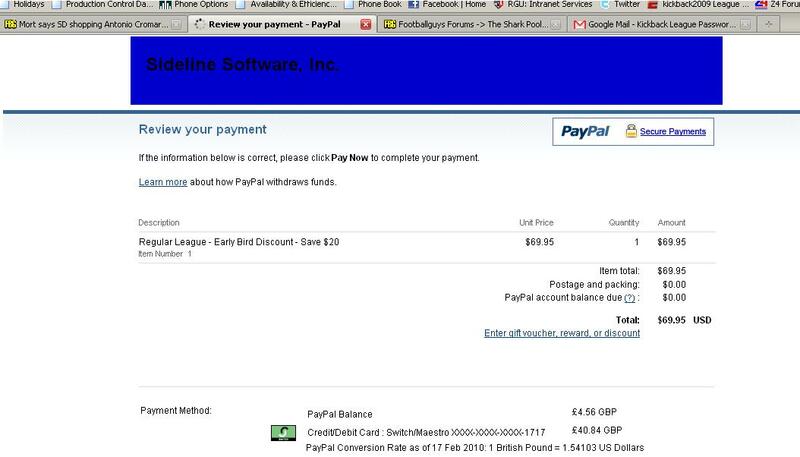 MFL offers discounts for purchasing the league early and the fee should be somewhere around $70. This works out at around $4.50 each per year. We can discuss whether putting more money in and playing for prize money is a viable option nearer the time. Can anyone who is interested in re-joining the league this year or anyone interested in reserving a franchise as a backup give me a pm. count me in again, like the sound of this one. Invites sent to a number of people. I've got a couple of people interested in taking over franchises if anyone is not up for it this year. Yeah count me in aswell, sounds good. I got your email so will hopefully check out the site at some point today. Hopefully I will have a better draft this time than I did last time. Like the sound of the idea. I'm definitely in for this. Stick me in as well butty. can anyone from last year's espn league who hasn't received an email invite to the mfl league can you let me know your email address and the team name you used last year and I'll get you added. If these guys could contact me as there's a couple of guys looking to join the league if you're not interested. Just bumping this up to see if anyone knows the guys named above and can see if they are still interested. I will email them butty through the espn league and direct them to this thread. I'm now thinking we may be better holding just one draft this year. I hadn't thought about the possibility of the NFL Draft in April having an effect on team's depth charts. (rams qb) for example. I'm keen to gather as many peoples views as possible on this before we get started. Also need views on how long a season to hold and how you want to do the draft? I'll pull together some of the issues and sent out a message through the league board. Think probably the one draft later in the year is a good idea. It'll also allow things like free agency, coaching changes and trades to settle down as well, so it'll give us a better chance to see what certain players are likely to do. Also I'd make a suggestion that we could have another league alongside the dynasty league. Just exactly the same as this year's one, with perhaps one or two tweaks. That way there's less of an emphasis on the future of players, it's all about here and now. Seems like it would be a good way of getting the best of both worlds. Obviously depending on what everyone thinks. For me personally I'm still hoping that Scott would run the ESPN league alongside this league? I'm pretty sure there would be demand for that. Will still be running the kickback league in sep, if i can get over coming 14th with a top 10 qb top 3 and 20 rb and top 5 and 24 wr. Good to hear, just shows how much of it is luck. Apart from Drew Brees my drafting was terrible and I'll hopefully be a bit more prepared this year. Just a quick update for everyone who is involved. MFL has just released their 2010 leagues. I have upgraded the league I set up earlier in the year and was hoping we could sort out league fees sooner rather than later. (You received a $20 discount for purchasing before June 2010). I've attached a screenshot of the payment screen just so you don't think I'm robbing you! With 16 teams the cost would work out at ?2.55 each although I'm open to putting more in and using the excess as prize money. I still have yet to hear from the following 4 people, if anyone could get in touch with them and find out if they're interested that'd be greatly appreciated. If they don't want to take part this year that leaves us with the option of finding 4 replacements (please note, I have some people on file who pm'd me their interest before), or moving to a 12 team league. I'd like to take a league majority vote on this. Thanks again and if you've got any questions about the league, payment or anything else feel free to send me a PM. Like the sound of it but I'm on holiday most of March so I'll probably miss the draft. Geoff, after some discussions we're going to hold the draft much later in the year (august/september time)! I'll keep your name on file if the other guys decide to drop out. Just thought I'd bump this up for those that didn't see it. my vote - keep it at 16 teams or more even if we have to replace a few. anything we can be doing with this in the mean time? That's what I'd prefer too as it keeps the teams a bit more interesting and makes the league a bit deeper. I don't have the usernames of the four guys I mentioned to try and see if they're interested, do you know what they are? What I'd like to do is get everyone's opinion on the issues I raised in the polls re how big to make rosters etc. I'm also trying to get agreement on a fee so that I can get the league paid for before it goes up in June. Have pm'd the three people that were interested in the remaining spots. If anyone is getting bored with the lack of action involved we could start the draft as soon as they're set up, have it run all through the summer, you can pick at your leisure and get an email notification when it's your turn. Let me know if you're up for it. 2 spots still remaining. Let's get these filled and get started! Do I have to do anything to guarantee my spot? Said I was interested a while ago then totally forgot about it. Just pm me your email address and I'll send you an invite. Whoever wants the last spot do the same, first come first served. Still not heard back from JamboJoe about the remaining spots. If anyone wants any of them the sooner the better as I think we should just kick off the draft in the next few weeks. No time limit per pick, you'll get a notification when you're on the clock. How's that sound for people? 2. Move to a 14 team league. I've emailed all existing league members re payment for the league which is due before 12th June. Names in red are those that have confirmed and are ready to pay. Not sure of the best way, paypal, bank transfer? late night drop? I'm still in (Inversneck).... can transfer you the cash if you PM your details. Sir Digby's Chicken Caesar has joined the league. Amount is ?3.05 based on the early bird discount. If we don't all pay by June 12th it'll be ?3.95, it's not much of a difference! Anyone wanting to send the money my paypal is [email protected], PM me if you want to use a bank transfer. One space left: reds have confirmed. Confirm that the Jambo Broncos will be returning. Will try sort out the payment details for you tomorrow. If anyone knows of anyone interested in the final place tell them to give me a shout. Received from both of you, thanks! If anyone knows how to get in touch with the guys that haven't responded yet that'd be greatly appreciated. Bump. Are people getting paid up? Just a quick update of people who have paid, those who have confirmed but haven't paid yet and those that I haven't heard back from. I've got one guy on standby should I not hear back from some people. Anyone with an interest should still let me know. If anyone can get in contact with those yet to confirm that'd be much appreciated. I spent yesterday lunchtime setting up this years schedule and have entered the additional league rules on the site, feel free to take a look (they're not quite finished yet). Scoring rules are also up there, decided to go with decimal scoring this year as it's the fairest method. Those In red have paid, blue have confirmed but yet to pay and black I'm still waiting to hear from. Oh and for those mock drafting, remember that this is a dynasty and that the guys getting up there in age (R.Moss, Favre, Manning) don't hold quite the same value as they do in redrafts).